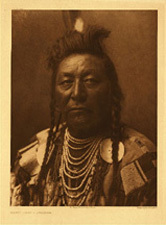 The first text we'll read this semester is a close examination of the life of the Crow chief Plenty Coups and how he led his tribe through a time period that witnessed the near total destruction of their traditional way of life. Let's use this space to think about questions of tradition and shared culture in understanding how people live and work together. Take a look at this website to read up about the differences between the two most famous portraits of Plenty Coups. 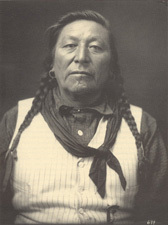 In the portrait taken by Throssel, on the left, the Chief is dressed in clothes that we might think of as "non-native"; in the portrait taken by Curtis, on the right, he's decked out in full Crow regalia. The portrait on the right may look more "authentic"—but it turns out that it's the Throssel portrait that most likely represents what Plenty Coups dressed like from day to day. To stock up our ethical "toolbox," we've been breading Aristotle's Ethics in conjunction with Jonathan Lear's book on Plenty Coups, Radical Hope. At the end of our first week of class, I'd like us to look back and take stock of the resources we've gained in learning to talk about what constitutes an "excellent life." As we continue our discussion of Plenty Coups next week, we'll have to think more carefully about the particular challenges he faced as the Crow ways of thinking about "excellence" and "happiness" slowly began to erode in the face of a changing reality. In class on Friday, May 22, we'll break into groups and work on a few sample discussion paper topics that will help us summarize the concepts we've covered in the past week. Here's a link to the page with our discussion paper practice. And here's a page created by one of our classmates about the history of the word squaw as used in our book. And another Insult or Misunderstanding? And one on the history of the name Sioux.